Boruto: Naruto Next Generations has finally reached the final battles of the Mitsuki Disappearance arc as Boruto and the others have come face-to-face with the final of the Fabrications which One such battle involved a huge stone behemoth and the only way for Boruto to defeat which was to linked with his wily new summon, Garaga. During an early phase of the Mitsuki Disappearance arc, Boruto and the others had to fight against the killer snake Garaga where Garaga agrees to form a summoning contract with Boruto in order to see just how untrustworthy humans are. He was betrayed by a former contract owner, so he chose to accompany Boruto to see just how Mitsuki would betray Boruto. There was only gets worse because Garaga sees Mitsuki attack Boruto at a later point, where thus commits to not helping Boruto in his battles. This all changes in the latest episode of the series as Garaga volunteers his services to help take down a large stone monster summoned by Kirara. Although he still calls Boruto a spoiled brat for making him take down the "sparks that are raining down," he admits that it's not a bad idea to trust in and help humans once more after seeing Mitsuki really was on Boruto's side after all. Garaga immediately makes a huge difference as the stone golem begins to spin him around until Garaga manages to wrap himself around the golem. 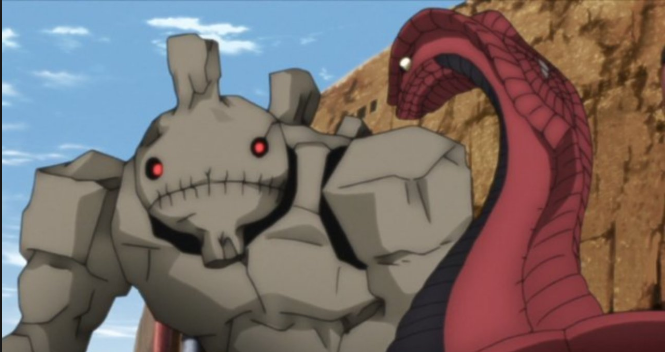 As it tries to shake off Garaga, Boruto jumps on his head and lands a successful Rasengan hit on the golem which leaves him open for Garaga to squeeze the golem so hard it completely break down into pieces.